Rams RB Todd Gurley has already made quite a name for himself less than halfway through his rookie season. More to the point, through five games, he has four in which he’s gained at least one hundred yards. All four, in fact, have come after a disappointing debut against the Steelers in week 3. In fact, only two other St. Louis Rams have recorded such a streak, and it’s precisely whom you would expect. Steven Jackson did so most recently, in the middle of the otherwise forgettable 1-15 2009 campaign. Over the stretch, he ran for 530 yards on 95 carries for a solid 5.58 yards / attempt and three touchdowns. The hapless Rams did manage to win their only game of the season in the stretch, though it’s fortunate that they drew 2-14 Detroit on their schedule that year. Marshall Faulk accomplished the feat twice. In his first season in St. Louis, on the Rams’ march to Super Bowl glory, he racked up 500 yards on 90 carries (5.56 per) and three touchdowns. He barely equaled the feat again in 2003, rushing for a *mere* 413 yards on 86 carries (4.86 per), punching the ball in to the end zone on four occasions. Perhaps more importantly, St. Louis won all eight games over those two stretches. 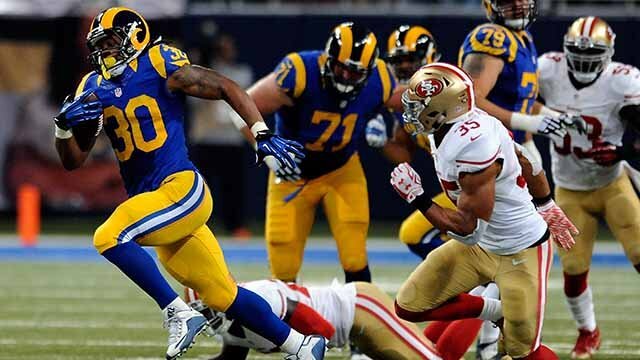 Over this current stretch, Gurley has rushed for 566 yards on 88 carries–6.43 yards per attempt! He also has three touchdowns and, moreover, the Rams are 3-1 during the streak. But just how good has he been, compared against the franchise’s entire history? After all, in addition to Faulk and Jackson, the Rams have also had Jerome Bettis and Eric Dickerson. Bettis never exceeded 100 yards in his sole season in St. Louis, but did surpass the century mark four consecutive games in each of his first two seasons (1992-93), both in Los Angeles. The stretch in his rookie season was statistically superior to Gurley’s, but, come on, he waited until his 11th game to really get things going! Charles White recorded five consecutive games of 100+ rushing yards in ’87, in the first of which he exceeded 200. He also averaged 31 attempts over those games, which is one higher than Gurley’s high-water mark in any game this season; White average a “mere” 4.63 yards / attempt those five weeks. Dickerson, of course, had a handful of such streaks. There’s a five-game stretch in ’86 (only 4.02 yards / attempt); separate four-game and six-game runs in his record-setting ’84 campaign; and another four-game stretch in his rookie season in 1983. That’s it. Gurley is the sixth Rams RB in the Super Bowl era, beginning with the 1966 season, to have four consecutive games of 100+ yards rushing. Dickerson, Faulk, and Bettis are all Pro Football Hall of Famers; Jackson is in the top 20 of all-time rushing leaders, though will probably end up on the outside looking in after playing for some really awful Rams teams; White was a Heisman winner and is a College Football HoFer, so that’s something, too. I’m not exactly getting ready to enshrine Gurley in Canton, but he should definitely be fun to watch over the remaining two months that Sith Lord Kroenke‘s Rams have in St. Louis.